I love how it add charm and character. It is beautiful in its design. I love the metal work because it is not heavy feeling. When I was in France looking at some of the older castles these chandelier have a similar feel without being to chunky or clunky. The Kosas Home Small Seville Chandelier is a candelabra-inspired home accent that combines Old World charm and modern convenience. 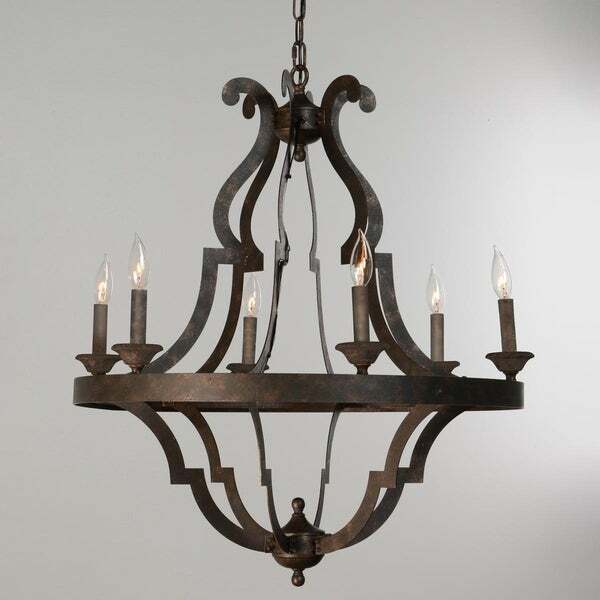 Hand crafted out of iron and finished with a rustic patina, this chandelier has the look of a true antique treasure. Six candelabra lights line the edge and will provide a warm, welcoming glow to any room in your home. Professional installation is highly recommended. To clean lightly dust with a feather duster or clean dry cloth. Dimensions 27.0 In. X 14.5 In. X 36.0 In. Surprise- build your light fixture! I was not expecting all the screws that were left out of the fixture for me to assemble. It is not a heavy piece- just strips of bronze decoration holding the wires and candles. I am surprised how exspensive it was for how cheap it looks. At night it looks nice - just not wrought iron. "What is the diameter of this light fixture? It appears that the diameter listed is the same for the larger one in this style also. " 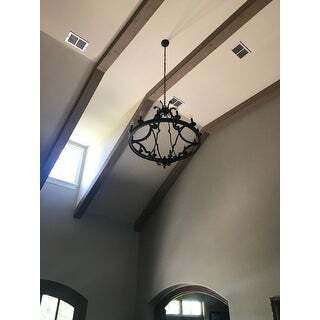 This chandelier is approximately 27 inches wide x 27 inches deep x 36 inches high.